Crawley Town are currently on a run of seven games without a win - and head coach Gabriele Cioffi says the club is 'challenging the pain'. 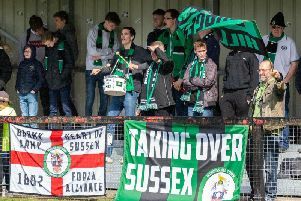 The defeat in the FA Cup replay to Southend followed four defeats and two draws - and that does not include the defeat to Haywards Heath Town in the Sussex Senior Cup. And a frank Cioffi said after Tuesday's night's extra-time defeat: "It’s a **** moment and we know this. "Correct me if I am wrong but last season they lost 10 games in a row in the league so I think we have to look forward. "I think together, and I will never get tired saying this, we can build. And building is tough, you need time you need effort, you need pain. And at the moment we are in a phase where we are challenging the pain." Crawley Town will look to get back to winning ways when they host Crewe Alexandra at the Broadfield Stadium on Saturday.